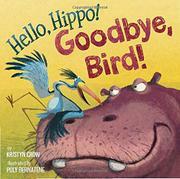 A solitary hippo tries to escape a pesky bird until it realizes having a pal may not be such a bad thing. When loquacious, harassing Bird lands on Hippo’s head with a cheery, “Hello, Hippo,” Hippo rebuffs it with an abrupt, “Go away.” Bird, blue and storklike, actively suggests Hippo needs a bird to perch on its head like a hat, to settle on its snout like a “hippopota-mustache,” to entertain it with silly jokes, and to protect it from spouting water with umbrellalike wings. Hippo eventually gets rid of Bird and revels in the freedom until the inadvertent disturbance of a wasps’ nest results in an attack, and Bird comes to the rescue by eating the insects. Incredibly, the still-ungrateful Hippo dismisses Bird, but when a thunderstorm brings pelting rain, Hippo suddenly misses Bird—and readers will agree with Bird’s assertion that it’s not just because Bird makes a handy umbrella. The contrasting forms of rotund Hippo, with expressive eyes and gaping mouth, and spindly Bird, with flamboyant blue feathers and nosy beak, dominate the colorfully boisterous mixed-media illustrations. 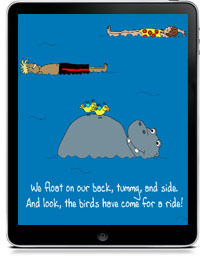 Rousing frames focus on Bird’s cavorting on indignant Hippo’s head, their dialogue (the only text beyond sound effects) incorporated into the illustrations. Scenes of Hippo submerged underwater, frolicking idyllically in the grass, and wailing in terror in the storm steal the show.